Korean and global automakers operating margin figures for the first half of 2012 came under scrutiny this week, with BMW, Hyundai Motor Company and Kia motors Corp. coming out on top of the pack. 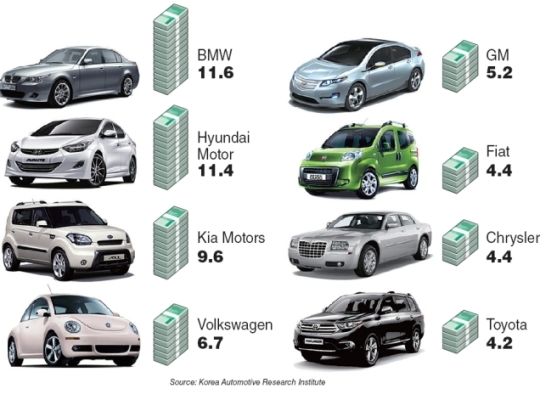 According to a study put together by the Korea Automotive Research Institute -KARI, the German and Korean automakers fought a very close battle for the best numbers. BMW posted an operating margin of 11.6%, with Hyundai coming in a very close second at 11.4%. Kia Motors Corp., the sister company of Hyundai and the Korea’s second-largest carmaker came in behind the top two with an operating margin of 9.6%. The top three were a good way ahead of the following pack which was Volkswagen (6.7%), GM (5.2%), and Toyota Motor Corp. (4.2%). The KARI report also revealed that both Hyundai and Kia had made massive strides forward in operating profit, posting 21% and 25% increases, respectively.